Established in 1985, Aurora Marble aim to seek out the best marble and transform it into the fire surrounds you will be proud to call your own. "We import the very highest quality marble to be found in the finest quarries located all over the world and then transform it into fire surrounds that will make the perfect focal point in any home"
With over 100,000 square feet of manufacturing, production and warehousing facilities, containing nearly a thousand tonnes of natural marble, micro marble and granite, Aurora marble can provide a fast and efficient service to meet and exceed the demands and expectations of their customers. 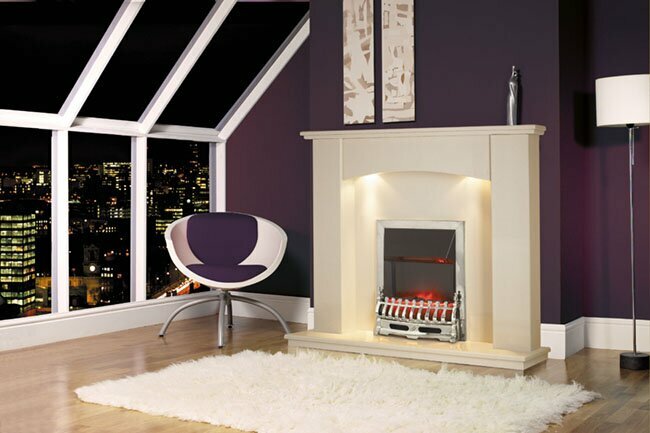 July 2011 saw Aurora Marble become part of Fired Up Corporation, strengthening their offering to the UK fireplace industry. Aurora Marble brought with it 26 years of experience of marble manufacturing and a reputation for producing excellent products. Featured in this below are a couple of Aurora Marble's best selling products ranging from Micro-marble to limestone and granite. The imaginative designs and styles ensure you will always find a beautiful Aurora Marble fireplace to complement your taste and decor. The majestic Taurus fireplace is reminiscent of late Victorian design with simple yet elegant corbels underneath a bevelled edge mantel shelf. This fireplace is designed to appeal to those with a love of the traditional. Finished in stunning black Granite, the Taurus can be used with any gas or electric fire to create a stunning centre-piece. The Sorento fireplace offers a bold statement in a beautiful Beige Stone micro marble. This fireplace is again designed to be used with a gas or electric fire and will provide your home with an elegant and stylish focal point that will fit both a contemporary or traditional interior, while the downlights help highlight the fire in the centre and further grab the attention of anyone in the living room. Opti-Myst, How Does It Work?